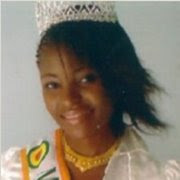 Languages: Miss Christel Mbila is fluent in French and Lingala. She also knows English a little bit. Eighteen year old Christel Mbila is a ‘go getter.’ Her motto in life is, “I am the Head not the Tail!” Christel hails from Kinshasa. Her country, Democratic Republic of Congo, is home to the second largest rainforest and fifth longest river of the world. Youngest of four sisters and four brothers, Christel just finished her diploma in tailoring. She wants to become a successful fashion designer. In her leisure times, Christel enjoys swimming, reading books on nature, and grooming her pet dog, ‘Capucine.’ Christel also loves to listen to Congolese music. Her favorite foods are fish and plantin.